Enjoy the magic atmosphere of Saint-Petersburg city and find out a lot of interesting facts about its history and culture. 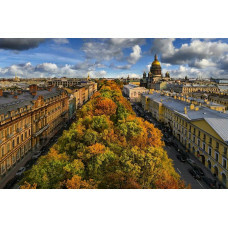 During the city tour you will see a lot of world-famous sights: Our Savior on the Blood Cathedral, Kazan Cathedral, St. Isaac's Cathedral, Palace Square and the Hermitage, Peter and Paul Fortress, Aurora battle cruiser. You will see the fascinating views of Neva river and smaller rivers and canals. The route goes across Nevsky prospect to the Palace Square, then to the Spit of Vasilyevsky Island and Hare Island. You will make a lot of photo stops during the tour and enjoy walking around the historical city centre.